I meet Ecuadorans and Colombians in Madrid — and should, according to immigration-to-Spain stats — but not as often as I meet Venezuelans: two waiters and a manager in one restaurant; the part-owner of another; students, job seekers, new arrivals. Ties between the two countries are old, run deep. Some Venezuelan expats have leaned on extended family networks to seek residency. How bad are things back in Caracas? As grim as I’ve heard, say they. Or worse. 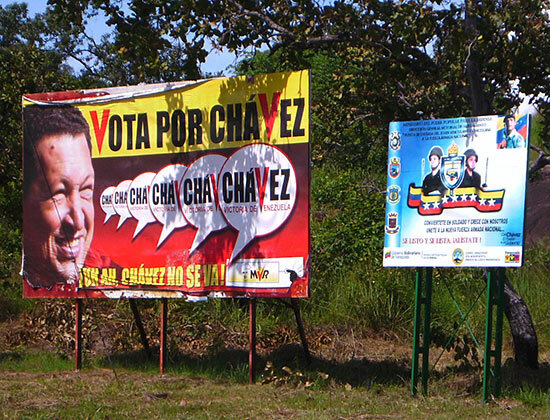 A few express nuanced views for late leader-of-the-Venezuelan-revolution (he-got-us-into-this-mess) Hugo Chávez. No one has a good word for current Venezuela strongman Nicolás Maduro. I judge the contempt as quiet and apolitical; Maduro’s crew is loathed not for leaning left, but for plundering, stealing, ruining. Why doesn’t such a universally reviled figure step down? European Union freedom-of-movement laws meant a pensioned Brit could ditch London fog, chase the rays in retirement to a beachfront retirement pad on Spain’s Costa del Sol. Locals assure me that I’ll hear English and German more often than Spanish on some blocks of Málaga. Or can now, at least, before Brexit. The UK’s EU check-out date is April, 2019. Hundreds of thousands of UK expats are in limbo. Should they seek Spanish citizenship? Will they need visas for visits home to mum? Picture a tourist in San Francisco. Where does she go? To Fisherman’s Wharf, via the Embarcadero; to Alamo Square to see the Painted Ladies. To Coit Tower, Russian Hill, Chinatown. Great sites, one and all. Oft-visited by locals. But do the locals live on Russian Hill, or near Alamo Square? A few do, sure, but not most. They join the walking tour, listen as the guide points out Alice Walker’s old house or reads the poem on the Hotaling Whiskey plaque, then return to dullsville digs in Daly City, San Leandro, Hayward, Vallejo. Expect roughly the same deal in Madrid, although the “‘burbs” are generally apartment complexes rather than single-family homes, and are linked to the city center by a vastly — and I do mean vastly — better transit grid. I meet Madrid born-and-raiseds in tours of Plaza Mayor, Retiro Park, Sol, Tribunal. The locals nod appreciatively at the Muslim Walls or Cervantes’ house, then ride the metro home to quiet, affordable Vinateros, Las Tablas, Alcorcón. My travels suggest that this state of affairs may exist worldwide, and offers a paradox: If there is anything worth seeing by a tourist, you probably are not in the most authentic part of the metropolis in question, the acres where natives settle, raise families, live their lives. And if you are in one of those authentic places as a tourist, you shouldn’t be. Tourist guides who shepherd honeymooners to sightsee in fabulous Hayward! Palomas! Downey! 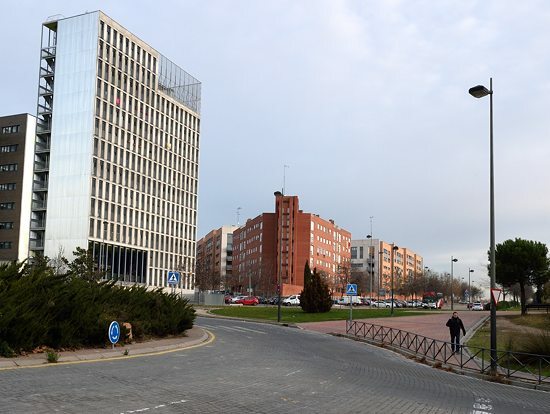 Leganés! are soon unemployed. Many Californians would eagerly back moving vans to pads in Alamo Square or Russian Hill, if said pads didn’t command seven figure price tags. The Madrid sticking point may be a bit different. One may afford an apartment in historically significant Malasaña or Lavapiés, but may live there less agreeably than in bread-and-butter Moratalaz. “Madrid cave” was my term for many central Madrid apartments visited in 2016 hunts for housing. 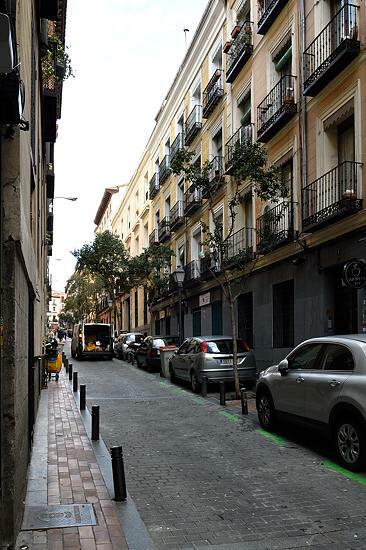 Consider this not-untypical side street in Malasaña. Charming, isn’t it? Pictureseque! Blocks from the metro, from Gran Vía! Have you ever seen such architecture in the States? How Old World, how European! How’d you like to actually live in one of those apartments one floor up? You wouldn’t get a lot of light, would you, on that narrow street, with two stories looming above you? And the natural light might come only from the windows facing the street. Some interior rooms may offer only single, inky-dinky windows overlooking clothes line and gloom in a center-of-the-building court yard. And, hey! how ’bout that occasional party of inebriated tourists, chug-a-lugging brewskies and yodeling songs on the sidewalk? How’d you like to try to bag forty winks while they haggle drunkenly over the lyrics to Stairway to Heaven scant meters from your pillow? Ear plugs? White noise? Or maybe an unannounced midnight trek to your friend’s pad in sleepy Daly City Moratalaz, for a snooze on his carpet? The new African immigrant may be to Madrid what the new Central American immigrant is to Los Angeles. The Guatemalteco or Salvadoran waits for a construction gig at Home Depot, toils over an overlock stitcher at a South Central sweatshop. 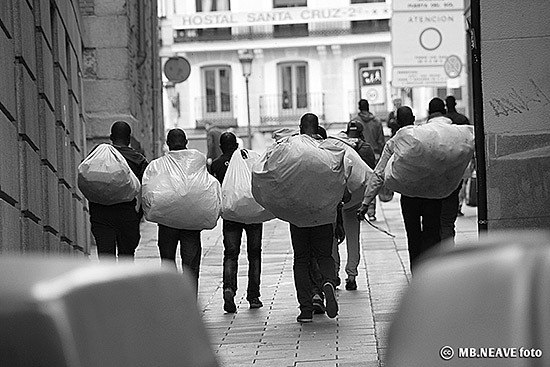 The African passes out fliers at metro entrances, or roams Madrid tourist blocks as a mantero, with wares — handbags, hand fans, undergarments — bundled in white sheets. He can unbundle and set up shop in seconds (amidst tourist swarms on Gran Via, at Puerta del Sol, or in a corner of his own in the metro labyrinth), re-bundle and make himself scarce as quickly, if told to leave. In 2016, I saw a half dozen flee from a shopkeeper wielding an expandable baton. 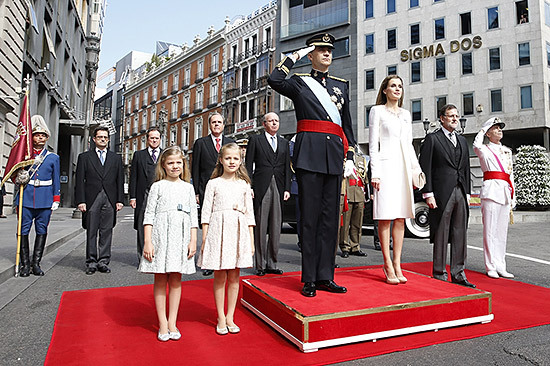 Spain has one, King Felipe VI, only son of King Juan Carlos I. Spaniards assure me that the twenty-first century gig is ceremonial. Fine, but then why does the press work itself into a lather over kingly pronouncements in time of crisis? “Eight out of ten Catalans saw the King’s speech!” hollered El Mundo, after Felipe VI weighed in on the secession crisis. Yankee Tim admits bewilderment. I suspect a complex relationship between public and throne, rooted in tradition, perhaps incomprehensible to outsiders. Felipe VI attended Georgetown, speaks excellent English. I can’t help regarding him with sympathy. He never asked for the rigors of public life, as much as emerged from the womb with responsibility for the national psyche chained to his shoulders. (♦) Spaniards celebrate Epiphany on January 6 — aka Día de los Reyes Magos — as enthusiastically as they celebrate Christmas. They also now “celebrate” Black Friday, although Black Friday arrives without Thanksgiving coattails, out of the middle of nowhere. Advertise enough, get people to do almost anything. A: Fur coats. Not seen for eons in California, but not yet entirely out of style here. Wearers are almost always north of fifty. (♦) Eager to flee all reminders of Hollywood? Plan on fleeing a lot farther than Spain. El País was jammed with Oscars coverage. Left-leaning Podemos political leader Pablo Iglesias gave the king a boxed gift set of the Game of Thrones TV series. This entry was posted in Europe, Expat, Madrid, Travel and tagged Expat, Madrid, Spain. Bookmark the permalink. Post a comment or leave a trackback: Trackback URL.